Vergessen Sie alles, was Sie über dem Land wissen. Das hier ist ein Genuss. Beginnen Sie Ihren Tag mit einem Schuss direkt aus dem Gras auf den Sandstrand, und am Ende es mit Blick auf den Sternenhimmel. Die Bäume in der Umgebung machen dies zu einem schönen Urlaubsziel, und es ist absolut atemberaubend im Herbst. Wählen Sie zwischen den Kajaks oder dem Paddelboot, um durch den See zu schweben, und veranstalten Sie eine Party in der Lagerfeuergrube. Die geräumige 3 BR, 1. 5 BA Cottage verfügt über eine voll ausgestattete Küche und neue Geräte. Das Master-Schlafzimmer befindet sich im Obergeschoss, mit einem Doppelbett ausgestattet. Die ½ Bad und das Bad sind beide im Obergeschoss. Schlendern Sie direkt aus der unteren Ebene und bis auf den kristallklaren See. Der Wasserstand beginnt flach, so ist es die perfekte Tiefe für die Kleinen in zu tummeln. Settle auf der Terrasse in und legen die Füße hoch, während Sie warten auf Ihre Burger Kochen auf dem Grill zu beenden. Nutzen Sie die Lage direkt am Wasser Hütte, die alle während Sie Ihre Zehen im Wasser tauchen und Ihr eigenes Abendessen fangen. Sie können auch unser Ponton-Boot während Ihres Aufenthaltes mieten. Es wird mit unserem nahegelegenen Haus geteilt. Es bietet Platz für weitere 14 Gäste, wenn Sie mehr Platz benötigen. Twin Lake hat das Best Western Michigan zu bieten hat. Komm, sieh uns! Das zweite Badezimmer (1/2 Bad) ist aus dem Schlafzimmer. Es enthält ein Dock, ein 14 ft. Aluminium Ruderboot mit Rudern, Tretboot und eine Feuerstelle für abendliche Lagerfeuer. A 20 ft. Pontoon Boot kann gemietet werden! Unser Ferienhaus ist nur wenige Minuten von verschiedenen Sehenswürdigkeiten in der Umgebung: Cedar Point, Michigan Adventure Amusement Park, Muskegon Cross Lake Ferry, Pristine Lake Michigan Strände / Sand Dunes, Western Michigan Sommer und Winter Festivals, Great Lakes unten Race Track, Air Show, Double JJ Ranch, Grand Haven, Whitehall / Montaque, Silver Lake und mehreren Golfplätzen. Es gibt für jeden etwas! The place is exactly as stated and shown in the ad. Great location, well stocked and clean. The lake is clean and sandy, and the beach in front of the place is great for any age, no surprised drop off as you venture out from shore. If your in the mood for a lake vacation, this is a awesome place. 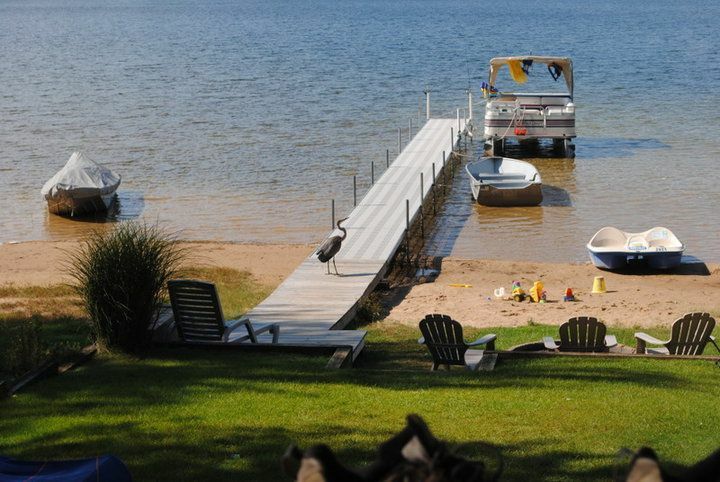 If you add the pontoon that's available for rent, it makes it even better. A welcome packet is sent out in advance contained all information that you needed for your stay, which was great. If you had a question or concern the owner will respond right away. We had no problems at all and had a great time. We would stay again. We enjoyed our stay very much! The cottage is roomy, and was very clean upon our arrival. Enjoyed watching the eagles fly around and land on the island. Also enjoyed the loons and chipmunks. The location is great, away from the city but yet close enough to jump in the car and go explore. Only negative would be that with 10 people staying you really need 2 full bathrooms. Would certainly stay there again. We really enjoyed our stay.The cottage is comfortable and well supplied.The only thing that would have made it better was a bathroom on the lower level.That’s where most of the sleeping space is and it would nice to not have to go upstairs all the time,especially in the middle of the night. We loved our time there.It was well equipped and comfortable.The only thing that would make it better is a bathroom on the lower level.That’s where most of the sleeping space is and it would be nice to not have to go upstairs all the time,especially in the middle of the night. Perfect vacation destination, very clean. Fall / Winter Monthly rate is $950.00 (+ utilities) There is a 4% Credit Card Transaction Fee for payments NO Fees for paying by check, money order or e-check Security Deposit of $350.00 is required. Saturday / Check - in @ 3:00 pm. Saturday / Check - out @ 10:00 am. This is a non - smoking vacation home. Please,no pets allowed. We can not rent nor lease to anyone under the age of 25. Maximum occupancy : 10 person limit.